I've always had a soft spot for the old Fantasy Warriors Dwarfs sculpted by Nick Lund, and in the late 80's I collected oh about a couple of dozen. The great Stuff of Legends site shows the original range hereand here. Then in the last couple of years someone invented Ebay and didn't put a warning label on it... The consequences are that I now have almost 450 of them. I dug them out today and organised them into units. Yes, I know there are too many of them to play a sensible game, but i do love the massed units look. 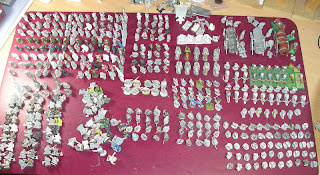 These figures are back in manufacture by Mirliton of Italy and Em-4 Miniatures here in the UK. This is the order of battle I came up with, based entirely on what i have, rather than any kind of sensible structure. It works out at 6,580 points without including tandards, msicians, leaders, hero's etc...! The numbers in brackets is the order i've just put in with Mirliton to fill out the remaining slots! If you're interested in Fantasy Warriors game then I suggest you join the FW Yahoo Group. Wow! What a haul! A couple of months ago I got 50 Grenadier FW High elves. I was especially excited to win that auction, as these models aren't being sold by Mirliton. I had heard it was because the deep undercutting of the models made for a difficult mold. Having now seen the models, I can confirm that. Elves = pixie fiddlers! The old FW elves were still being manufactured by somebody in the states - I understood that the moulds had been separated when Grenadier US failed. The Moulds for Grenadier UK (the Parent company) are in the hands of Doug from em4 miniatures (Doug was a director of the original company) He regularly posts on the Fantasy Warriors Yahoo Group here... http://games.groups.yahoo.com/group/FantasyWarriors/ Doug is a very helpful bloke and may be able to shed more light on stuff if you ask. I asked Doug several months ago about this. He wasn't planning on manufacturing new models, but he said he would check for old packs. I never heard back if he found any. I'm on that yahoo group too, but don't go too often. Maybe I'll check through the old posts there. I could use some command models. Andrew - I just did a deal with doug for some old grenadier orc stock and he was happy to help - might be worth trying again?